Despite public calls for the Scottish Legal Complaints Commission to get on with the task of monitoring the infamous 'Master Policy' professional indemnity insurance scheme of Scots solicitors & advocates, which is now universally known for protecting crooked lawyers, the best the Commission has achieved after talking about doing something for nearly a year is an announcement on it's website of its intentions to seek a contractor to carry out the study. SLCC covertly met Marsh & Law Society June 2008. However, while solicitors clients who are being assisted by the likes of Cabinet Secretary for Finance, John Swinney, were making requests to the Commission to give their views & input on actual experiences with the Master Policy & Guarantee Fund, only to be told by the SLCC it had yet to decide on how to proceed on the issue, it has now been revealed in heavily censored papers, the Commission had actually met in June 2008 with the Law Society of Scotland and the discredited insurers Marsh UK, who had given several presentations to members of the Commission on how the profession views the workings of the Master Policy. An insider linked to the SLCC claimed earlier this week: "No one at the SLCC wants to deal with the issue of the Master Policy because it has caused so much controversy over the years. These delays are nothing but a stalling tactic to put off any real input coming from the public because we know its going to be very bad what comes in". "The Law Society and Marsh were desperate to get their views across before anyone else could make their case about their own dealings with the Master Policy & Guarantee Fund, and there was little will at the SLCC to engage the public in any way at all at on the issue". The SLCC's Chief Executive, Eileen Masterman, who is on a salary of £70,000 a year, also doesn't seem to know which way to turn on the issue, after being spectacularly caught out admitting the commission didn't even have a copy of the Master Policy itself, and hadn't bothered to ask for one during the presentations with Marsh & the Law Society, Masterman going on to admit she might not even seek a copy of the documents of the multi billion pound Master Policy which her office is supposed to be monitoring, as per functions laid down in the legislation which created her huge salaried job in the first place. So it appears we have what is claimed to be an 'independent' & 'impartial' commission responsible for handing complaints against Scottish solicitors & overseeing key issues of consumer protection in the Scots legal services market, which doesn't seem to want to actually do its job, and worse, seems to be run from inside the legal profession itself which created the problems in the first place, necessitating the intended reforms contained in the Legal Profession & Legal Aid (Scotland) Act 2007, which now seem all but lost on the SLCC, staffed & run mostly by ex Law Society officials, ex members of Law Society committees, ex Police, and others from the world of self regulation. The SLCC appear to not want to face the realities of just how bad the Master Policy & Guarantee Fund are, but the world has already leaned some of the devious & corrupt goings on in the Master Policy after the confrontation between Cabinet Secretary John Swinney and Douglas Mill, the Law Society's ex Chief Executive who clashed with Mr Swinney over the content of Mill's own memos, revealing a long standing Law Society policy of protection of 'crooked lawyers' against complaints & financial claims by solicitors clients & members of the public. Cabinet Secretary John Swinney exposed solicitors corrupt Master Policy at Holyrood.John Swinney not only took Douglas Mill to task, he also revealed that others within the Law Society of Scotland, including Kenneth Pritchard, Mill's previous Boss, had also operated a Law Society scheme to protect 'crooked lawyers', even intervening in clients access to justice and demanding solicitors cease to represent those who were attempting to claim against the 'Master Policy'. You can read more about the Mill video and just how corrupt the Master Policy & Guarantee Fund are in some previous reports I have made on the subject here : Law Society boss Mill lied to Swinney, Parliament as secret memos reveal policy of intervention & obstruction on claims, complaints. & here : The Corrupt Link Revealed - How the Law Society of Scotland manages client complaints & settlements. With allegations that insiders from the legal profession and elements of the SLCC and Scottish Government will seek to undermine the 'study' once again, to exclude the likes of John Swinney's Parliamentary evidence, and the many experiences from members of the public which condemn the Master Policy & Guarantee Fund as corrupt and a sham … what can we really expect from such a 'study' which seems to have standing orders to 'find no fault' with lawyers and exclude the truth ? Here follows the 'independent' Scottish Legal Complaints Commission's 'study contract' advertisement from the commission's website. The Scottish Legal Complaints Commission (SLCC) is currently seeking expressions of interest from contractors who wish to be invited to tender for the above contract. The SLCC was created under the Legal Profession and Legal Aid (Scotland) Act 2007 and its main function is to handle complaints against members of the profession. In addition, its wider remit under s39 gives the SLCC oversight with regard to the operation of professional indemnity insurance by relevant professional bodies, including the Scottish Solicitors’ Master Policy and of the Scottish Solicitors’ Guarantee Fund. The SLCC is seeking to commission research on the purpose and function of the Master Policy and Guarantee Fund and of the professional indemnity arrangements for Members of the Faculty of Advocates. The work will take place between March and May 2009. The research methods will be developed by the contractor in collaboration with the SLCC. A budget of up to £15,000 inclusive of overheads and VAT will be available. If you wish your organisation to be considered for this project, please complete an Expression of Interest form and return it to Richard.Whitecross@scotland.gsi.gov.uk by 12 noon, Wednesday 18 February 2009. Click Completing an Expression of Interest Form for further information. Earlier this week the Dean of Faculty, Richard Keen QC, appeared in the media to call for a lifting of the ban on Class Action litigation in Scotland, ending a long tradition and campaign by Scotland's legal profession to keep class action litigation out of reach of Scots, due to the Law Society of Scotland's fears that thousands of clients of 'crooked lawyers' may turn on the legal profession itself and instigate class actions for the profession's governing body's poor regulation of solicitors work and lack of compensation to victims. A lifting of the Scottish Government's ban on class action litigation in Scotland would be a most welcome matter, ending a prejudice maintained against ordinary Scots for too long, at the behest of vested interests in the legal profession, who until now, have not raised the issue as a matter for reform, with regard solely to the public interest. However, the Scottish Consumer Council, now renamed Consumer Focus Scotland, have been calling for class action litigation to be allowed since 1992, and the Scottish Law Commission also recommended progress on the issue in 1996, so Mr Keen QC is slightly tardy in his recent call that class actions be allowed. The Royal Bank of Scotland is of course, first in the firing line apparently, as members of Scotland's legal profession are letting it be known they feel there should be a raft of class actions against the RBS, particularly due to an alleged lack of information relating to rights issues, which have been used to fund takeovers, such as the disastrous RBS participation in the deal for Dutch banking giant ABN Amro, which has effectively brought the RBS to its knees. As we see however, from the Scotsman’s report on Richard Keen QC’s call for class actions to be enabled in Scotland, his suggestion apparently relates only to the banking sector, as perish the thought class actions could be used against any other sector of business in Scotland, including of course, his own beloved colleagues in the legal profession, who themselves receive upwards of four thousands complaints a year on everything from poor service to widespread embezzlement of client funds. It is slightly strange, the Scots legal profession should now feel this way about its own bank, as the Royal Bank of Scotland handles a significant amount of business for the Law Society of Scotland itself, as well as thousands of solicitors and legal firms in Scotland. As things appear not to be as they seem, we must therefore examine the legal profession's motives for this abrupt change of strategy towards their once friendly business partners such as the RBS, who even sponsor the Scots legal profession’s annual legal awards ceremonies for the ‘quality’ of solicitors legal work ! I note for instance, what has seemingly escaped mention by the Dean of Faculty, is the coincidental fact many of those 'sweet finance deals' which solicitors & legal firms have regularly received from the banks, as a reward for steering client funds into particular banks & other financial institutions, have effectively come to a halt due to the financial turmoil in the banking sector and the low levels of interest rate returns currently on offer. The only person excluded from this deal, is you, the client. So, while perhaps, your house purchase is delayed supposedly due to the signing of a few extra documents, or a few loose ends, or perhaps your dead wife's estate takes a whopping four years to be confirmed & finalised, or some other legal work or case you are involved in is taking years and hundreds of letters to achieve only a little momentum, your solicitor and their legal firm will be earning a significant rate of interest and finance, and the bank will be profiting from their holding of clients funds for a little longer, while you are none the wiser for what is going on. Little doubt therefore remains as to why the legal profession has now turned against it’s once business partners in the financial community .. its all about money, and the lack of it, nothing to do with the public interest or improving the rights & entitlements of Scots when it comes to Justice & Law. As it happens however, there is a more reasonable & public spirited approach to the matter, in the form of a Petition before the Scottish Parliament calling for class action litigation to be allowed in Scotland. You can visit the Petition and sign it online HERE. Please sign the petition, it is in your best interests that we as a country are not excluded from the legal rights & entitlements which hundreds of millions of others enjoy around the world. Calling on the Scottish Parliament to urge the Scottish Government to instigate a class action procedure or similar in Scots Law to correspond with the legal systems of many other countries including England and the United States. There is documented evidence (ref1) that some people are denied access to justice within the Scottish legal system for many reasons including their perception that court action is prohibitively expensive. Specifically, in Scots Law there is no mechanism to allow a group of people with the same grievance to collectively take litigation action against a commercial company. A Class Actions procedure in Scots Law has been called for since 1982 (ref2) and, in fact, was recommended in 1996 by the Scottish Law Commission (ref3). Draft court rules were also presented in this report. Nevertheless, in 2000 the Court of Session Rules Council decided that existing procedures were adequate and, hence, the recommendation of the Scottish Law Commission has, to date, not been implemented. The ongoing Scottish Civil Courts Review is currently considering the introduction of a Class Action procedure in conjunction with many other proposals. Its recommendations are due for publication in Spring 2009. This is a promising development but, as stated by Lord Gill at the consultation paper launch in November 2007, the review needs to ensure that [members of the publics] voice is heard and that their interests are central to any recommendations for reform that we make. One can only wonder as to why the SNP controlled Scottish Government have not made it a priority to change the law allowing class actions, but as Justice Secretary Kenny MacAskill has always said, even on video, he will always protect the legal profession from just about anyone or anything .. so perhaps not too much need to wonder why there has been no action on the matter yet. Here follows the Scotsman’s report on the Dean of Faculty ‘breaking ranks’, so to speak, and calling for class actions … against banks. How about allowing class actions, without restrictions, Mr Keen ? ONE of Scotland's most senior lawyers is calling for ministers to scrap the restriction banning class actions in Scots law, a move that could see a wave of claims against banks. The suggestion by Richard Keen, QC, the dean of the Faculty of Advocates, would open up the prospect of challenges by groups of shareholders against financial institutions over a lack of information about the state of their business. It is understood that Scotland's legal profession believes there could be a raft of actions against Royal Bank of Scotland and other financial institutions on the basis that the information given out at the time of rights issues had been inadequate. Mr Keen said: "The absence of class action certification inhibits pursuit of remedy. It is difficult to fund major litigation of that kind unless you can put together a class action." Mr Keen's comments follow a string of calls from politicians demanding legal and political action to tackle the crisis – with RBS most in the firing line. Alex Salmond, the First Minister, said yesterday that he believed a parliamentary inquiry should be carried out into the banking crisis in Scotland. He said any investigation should cover the Financial Services Authority and the role of politicians in overseeing the administration of the financial sector "to ask them why they were asleep on the job". He said: "I'd rather favour a parliamentary investigation, not just into the Royal Bank of Scotland – that would be daft, as the Royal Bank of Scotland is only one of hundreds of banks worldwide which has got into serious trouble – but into the financial sector." It emerged at the weekend that Christine Grahame, an SNP MSP, has written to Lothian and Borders Police, demanding that an investigation be carried out into RBS's conduct over its two rights issues last year, while Tavish Scott, MSP, the leader of the Scottish Liberal Democrats, has called for an investigation by the Serious Fraud Office. Under the leadership of Sir Fred Goodwin, RBS carried out its first £12 billion rights issue in April last year, when thousands of investors forked out £2 a share for a tranche of new stock in the firm. A second rights issue, in November, was shunned by investors and the government had to underwrite the £15 billion issue. RBS's fortunes have nosedived in recent months, with investors watching shares plummet, to close at 12.1p on Friday. Mrs Grahame's letter told police she believed RBS "appeared to have committed a fraud". RBS revealed last week it was on course for the biggest loss in UK corporate history, as it expected to write down as much as £20 billion on the falling value of its assets. Mr Scott said: "I think the banks across the UK must have known what their financial position was much earlier than they were letting on, and that particularly applies to RBS. "At the time they were asking investors for more money to help their financial position, as RBS giving a full picture of how strong or weak they were as a financial institution? I genuinely don't know, but I believe that the Serious Fraud Office should have a look at it." He warned that a political inquiry could turn the crisis into a partisan issue and could detract from solving the question of whether investors were misled. Just last week, the veteran lawyer Ian Hamilton lodged a small-claims action against RBS, saying he had been persuaded to buy 640 shares at the £2 offer price in its 2008 rights issue. A spokeswoman for RBS refused to comment. Nigel Don MSP, who is a Ministerial aide to Justice Secretary Kenny MacAskill, and also sits on Holyrood's Justice Committee as well as the Petitions Committee, has been revealed to be receiving some £688 a month from the taxpayer to pay for a mortgage on a flat in Edinburgh, after being reportedly involved in “coordinating” £765,000 in property deals to claim a controversial mortgage allowance”, according to an investigation in the Sunday Herald newspaper. From the Sunday Herald story : “Nationalist MSP Nigel Don was unable to claim mortgage interest on a flat in Edinburgh as he lived in Dundee - which was too close to Holyrood for the subsidy. But the SNP politician sold his family home of 19 years, bought a house in Aberdeen and then used his new found eligibility for the taxpayer-funded perk to buy a property in the capital"
The deals were completed a month before an independent review of MSP allowances backed the abolition of the mortgage scheme last year." Mr Don recently appeared in video footage released from the Parliament, involving an important 'access to justice' petition, seeking to widen rights of audience in Scotland's courts, and widen public choice of legal services. Justice Secretary Kenny MacAskill. 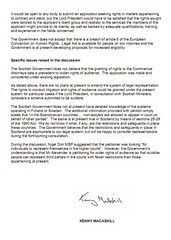 Mr MacAskill, in his own submission to Holyrood's Petitions Committee, which is available on the Scottish Parliament's website HERE ended his letter to the Parliament with a surprising rebuke to Mr Don, claiming his own Parliamentary aide had got it wrong on the subject matter of the access to justice Petition which was under discussion. Justice Secretary Kenny MacAskill was forced to correct Nigel Don’s 2½minute speech to Petitions Committee : "During the discussion, Nigel Don MSP suggested that the petitioner was looking “for individuals to represent themselves in the higher courts”. "However, the Government’s understanding is that Mr Alexander is petitioning for wider rights of audience so that suitable people can represent third parties in the courts with fewer restrictions than those appertaining at present." The overall tone of Mr MacAskill's letter however, was still against the terms of the access to justice petition raised by Bill Alexander, Chairman of the Association of Commercial Attorneys, indicating at the very least, rather than Mr Don’s comments being a simple ‘misunderstanding’ of the Petition, Mr Don as Mr MacAskill's Parliamentary aide would have been well aware of the Scottish Government's policy against Petition 1197 going forward, and the Justice Secretary’s continuing attempts to block wider public access to justice in Scotland, in favour of supporting a continued Law Society monopoly on legal services. Here follows the Sunday Herald report on Nigel Don's £688 a month mortgage allowance paid for by you, the taxpayer. A Ministerial aide has admitted “coordinating” £765,000 in property deals to claim a controversial mortgage allowance that was about to be scrapped, reveal Paul Hutcheon and Tom Gordon. A MINISTERIAL aide has admitted "coordinating" £765,000 in property deals to claim a controversial mortgage allowance that was about to be scrapped. Nationalist MSP Nigel Don was unable to claim mortgage interest on a flat in Edinburgh as he lived in Dundee - which was too close to Holyrood for the subsidy. But the SNP politician sold his family home of 19 years, bought a house in Aberdeen and then used his new found eligibility for the taxpayer-funded perk to buy a property in the capital. The deals were completed a month before an independent review of MSP allowances backed the abolition of the mortgage scheme last year. Don told the Sunday Herald that his property move were a necessary part of a plan to boost the SNP's profile in marginal seats - with Dundee already represented by the SNP, the Nationalists wanted him to cover Aberdeen. The MSP, who earns £55,381 a year, also described his publicly-funded mortage perk as "one of the compensations" of the job. The revelations further discredit the Edinburgh Accommodation Allowance (EAA), which allows MSPs outwith commuting distance of the capital to charge the public for mortgage interest on a property in Edinburgh. The scheme is to be abolished in 2011. The Sunday Herald can reveal that Don, elected to serve the North East in 2007, only became eligible for mortgage interest after a flurry of property deals. He and his wife lived in Dundee's west end between 1989 and 2008. Documents from Registers of Scotland show that Don, an aide to Justice Secretary Kenny Macaskill, made himself eligible for the allowance after selling his family home for £290,000 in January 2008. Within the space of three weeks, he bought a £310,000 property in Aberdeen - which is within the radius of support for mortgage interest - and purchased a £165,000 flat in Edinburgh. He then started to bill the public for the mortgage costs on his capital flat on St Clair Road. The Justice Committee member's transactions were completed a month before an an independent review backed abolition of the mortage scheme. MSPs have since voted to scrap the system in 2011 and no new entrants will be allowed to enter the scheme. Don, who claimed £3281.85 in hotel costs before he became eligible for mortgage costs, can now draw on an £11,900 allowance to cover interest payments. The Parliament's expenses database shows that in February last year, the month before the scheme was flagged up for abolition, Don started to claim £688 a month in mortgage costs. In the same month, the former Dundee councillor billed the taxpayer £5089 in other costs associated with his move to Edinburgh. He claimed £1057 for conveyancing, £1499 in legal fees, £329 in removables, as well as £223 in surveyors' costs. As an MSP for the North East, Don is elected to represent nine constituencies in a region that runs from Dundee to Fraserburgh. However, in an interview with the Sunday Herald, Don said he moved to Aberdeen to focus on the three constituencies that do not have an SNP base. He said: "There are nine constituencies in the north east region, and the SNP has constituency members in six of them. The three which we don't are West Aberdeenshire, Aberdeen Central and Aberdeen South. At a practical level, my job is to cover those kinds of areas. "Those are the areas where the party is expecting me to do the work, because the party already has cover in the other constituencies." Asked whether he was aware that his move to Aberdeen would make him eligible for the mortgage perk, he said: "There's no doubt at all that, having established that if we were moving to Aberdeen, we would be eligible for some kind of accommodation allowance in Edinburgh, yes. Plainly we were aware of that. And as you say, the two were coordinated." On whether he thought claiming mortgage interest was a sweetener for moving to Aberdeen, he said: "I would describe it as one of the compensations." His property shake-up follows LibDem MSP Jamie Stone also signing up to the mortgage interest scheme at the 11th hour. Stone stayed in a bed-and-breakfast in Edinburgh until early 2008, when he bought a £180,000 New Town flat weeks before the independent report was published. Don's use of the allowances scheme emerged last week after the publication of Holyrood expenses, which the Sunday Herald can reveal also laid bare the practice of MSPs doling out public money to friends and colleagues. A spokesman for the Taxpayers' Alliance said: "It is shocking to that any MSP could think it was acceptable to take advantage of taxpayers' generosity in this way. It also seems a remarkable coincidence that this gentleman should move so close to the publication of the review." PAUL HUTCHEON (PH): "Some cynincs might say your property dealings were made to make yourself eligible for mortgage interest." NIGEL DON (ND): "If you wanted to take that line, it would be very difficult for me to tell me you were wrong, but you are wrong. What you will realise, Paul, is that the North-East region stretches from Dundee to Fraserburgh. I was elected, much to my surprise, from my Dundee home in the very western tip of that area. It is an area far too big to cover from where I lived. What my wife and I did was to move up to Aberdeen, quite simply, to be able to do the job. "I think you will also recognise the practical politics of that. There are nine constituencies in the north east region, and the SNP has constituency members in six of them. The three which we don't are West Aberdeenshire, Aberdeen Central and Aberdeen South. At a practical level, my job is to cover those kinds of areas." PH: "So by moving to Aberdeen you were setting up a political base?" ND: "Those are the areas where the party is expecting me to do the work, because the party already has cover in the other constituencies." PH: "Were you aware that by moving to Aberdeen you were making yourself eligible for mortgage interest support?" ND: "There's no doubt at all that, having established that if we were moving to Aberdeen, we would would be eligible for some kind of accommodation allowance in Edinburgh, yes. Plainly we were aware of that. And as you say, the two were coordinated." PH: "Was claiming mortgage interest a sweetener for moving to Aberdeen?" ND: "I would describe it as one of the compensations, Paul...There was no way I could operate from Dundee." PH: "What would have prevented you from moving from Dundee to Aberdeen, but continuing to claim hotel expenses in Edinburgh, rather than mortgage interest?" ND: "There would have been nothing physically to prevent me from doing so. Working out of a hotel for long is desperately difficult...it's not a very good way of doing a job. Secondly, by the time you have been there for a while, it quickly adds up to same sort of bills." PH: "Your property dealings were completed weeks before the Langlands report backed the abolition of the mortgage interest scheme. Is this just a coincidence?" ND: "I was just getting on with what had to be done. I was working within the rules of the time." PH: "What did you mean when you said claiming mortgage interest was a 'compensation'?" ND: "You suggested it was a benefit, and I downgraded it to a compensation." PH: "Is it not fair to say that, if Labour had held Dundee West, then you would have continued to live where you were, as there would not have been an SNP base there?" ND: "I think that's a perfectly fair view of what might have been. It's a perfectly rational view." While Justice Secretary Kenny MacAskill is in Canada, wasting yet more taxpayers money on the failing "Homecoming" project, the Scottish Legal Complaints Commission has been engaged in spinning out a story to cover up the SNP controlled administration's little talked about multi million pound gift to the lawyers complaints quango, which has mostly went on personal benefits, huge salaries, pension schemes and personal insurance policies for a bunch of lawyers, retired Policemen, and other alleged experts in the field of regulating complaints against lawyers. This week, desperate to avoid any further bad publicity or hard questions on its income, the Scottish Legal Complaints Commission issued a Press Release to newspapers calling their budget proposals a "budget reflects needs of both consumers and legal practitioners"
However, the quango has refused to pay back the millions of pounds it received from the Scottish taxpayer, at the behest of Justice Secretary Kenny MacAskill, who himself has acknowledged he will not seek the return of the much needed public money already wasted on the Commission, which has yet to generate the increased consumer confidence in the Scottish legal services market it was created to do. The Commission's controversial decision to lower the annual complaints levy which solicitors must pay to fund the body which investigates complaints against Scottish lawyers, rather than repay the public purse, despite receiving over £2.4 millions pounds from the Law Society of Scotland by the end of last year, raises questions on just who the SLCC is serving, as clients of solicitors now find it is almost impossible to get the Commission to actually investigate complaints against solicitors, with many encountering a huge list of excuses given for the quango to take on cases against crooked lawyers. Jane Irvine, SLCC Chairman. Jane Irvine, the SLCC's Chairman was asked for comment this week on why, despite having huge surpluses of cash, the Commission had failed to repay the millions of pounds of public money it had received, before lowering the amounts solicitors had to pay to keep it running. Short of an explanation it seems, for the obvious, where one would think in these tough financial times, public money should be repaid rather than being handed over to lawyers, Ms Irvine denied any responsibility for the matter, and simply replied "The two sets of monies are not linked and it is not within my control." Well, that's just great isn't it ... people all across Scotland are waiting to get into hospitals for life saving operations, people's homes are being repossessed, public services are in danger of being cut back, many of Scotland's financial institutions have had to be rescued by the Bank of England, but the Scottish Legal Complaints Commission, and the Justice Secretary Mr MacAskill, himself a lawyer, are happy to shower a group of lawyers with millions of pounds of public money. Does anyone think that is justified ? particularly in these troubled financial times ? An insider at the Justice Department commented to me "there have been moves by the Scottish Government to hamper public discussion of the sensitive subject of public funding of the SLCC" .. and little wonder, given that the SLCC has spent most of the money on itself and personal benefits so far, rather than doing the actual work the Scots public were promised it would actually carry out. Jane Irvine : “As an independent, impartial and accessible organisation, the budget has been developed after listening to the views of both consumer organisations and legal practitioners." Independent, impartial & accessible ? How can that be, when one of the first decisions the SLCC took was to refuse to investigate any complaint against a solicitor involving work which took place before 1st October 2008. The SLCC is of course, staffed by members of the Law Society of Scotland, and its Board is made up mostly of lawyers, ex Police officers & others who have been involved in self regulation for years .. hardly impartial or independent or accessible. Yes, so it seems .. but it seems the economic downturn has caused many solicitors to start faking up their bills to clients, adding fictitious work and inflating accounts, along with threats & menaces if bills aren't paid within a few days ... and strangely enough, or perhaps conveniently for Ms Irvine and her associates, the 'independent impartial & accessible SLCC is telling people it wont investigate such cases if the work happened before 1st October 2008. What high standards are we talking about here ? Scotland has the poorest quality legal services market in the developed world, with clients paying up to 10 times more for legal services than anywhere else, and still not getting success or satisfaction in their legal affairs. Jane Irvine again : “However, consumer organisations want to see higher standards of service and early resolution of complaints. With this in mind, the SLCC will double charges where a complaint is upheld. The minimum charge will rise from ***£250 to £500. The financial implications of an increased complaints levy should encourage practitioners to resolve complaints at an early stage." Really ? 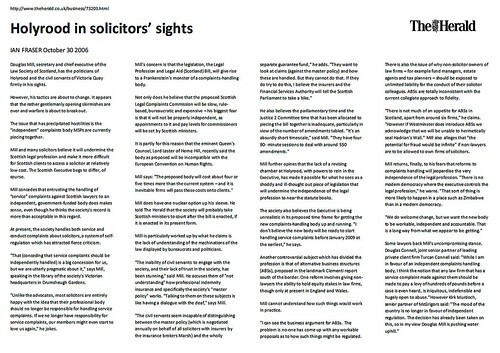 I don't think anyone with a shred of experience in dealing with solicitors will believe that for a second ... rather it will simply increase the amounts that lawyers are prepared to steal from their clients, all because they know they can get away with it due to the very poor and very biased way in which regulation of complaints against solicitors are still being handled in Scotland, by a Commission which claims itself to be "independent, impartial & accessible"
As a final kicker to the story, revelations surfaced this morning it was the legal profession itself in the form of the Law Society of Scotland who had been campaigning for a reduction in the levies, and it seems judging by the SLCC’s Press Release, that campaign was successful so its lawyers before clients once again in Scotland. What that how it was meant to be with the LPLA (Scotland) Act 2007 ? So, we must ask ourselves, who is it the Scottish Legal Complaints Commission is actually here to serve ? the public ? or solicitors and the Law Society of Scotland ? and why is the Justice Secretary simply dismissing consumer interests at every turn and siding each time with the legal profession over regulation issues ? Here follows the SLCC’s budget statement, and HERE is a link to the story in the Scotsman newspaper, who sadly fell for the badly spun argument of paying public money to lawyers instead of returning it to the taxpayer. The Scottish Legal Complaints Commission (SLCC) has announced budget proposals for 2009/2010 which should benefit both consumers and legal practitioners. Set up under the Legal Profession and Legal Aid (Scotland) Act 2007, the SLCC investigates complaints made by members of the public about services provided by legal practitioners in Scotland. The Commission opened for business on 1 October 2008 and although operating wholly independently of the legal profession, it is funded by legal practitioners in Scotland through the payment of an annual levy and charges imposed when a complaint is upheld. Commenting on the proposed budget, SLCC Chair Jane Irvine said: “As an independent, impartial and accessible organisation, the budget has been developed after listening to the views of both consumer organisations and legal practitioners. “The economic downturn has already impacted upon the legal profession and a *recent survey of 196 firms indicated that 304 people, mostly support staff, had already been made redundant. “Legal practitioners already working to high standards will benefit from the levy being reduced from **£409 to £275 and the £200 charge for mediation will be removed. The original budget for the Commission’s first year of operation was £3,493,823. Operating costs for the next twelve months are significantly reduced with a proposed budget of £2,985,102. *Source: Economic Impact Survey, December 2008 published by the Law Society of Scotland. **A 12-month annual levy charge for 2008/09 should have been £409 but the actual charge for the 9-months of operation was £307. The Royal Bank of Scotland's failure, which has led to the bank effectively being nationalised by the UK Government to save it, and save its customers, was nothing to do with either Sir Fred Goodwin or the Bank's 'takeover too far' of the Dutch Bank ABN Amro, so says Douglas Mill, former Law Society Chief Executive and school friend of Sir Fred Goodwin. Douglas Mill - it wasn't the Bank or Sir Fred’s fault, it was the lack of governance & control ! Douglas Mill, said in a BBC Scotland interview, which highlighted the alleged failures of Sir Fred Goodwin, whom some newspapers have dubbed "The World's worst banker" :"Well scapegoating is the right expression.". Douglas Mill would know all about scapegoating, and how to avoid it, as he did for around eleven years as Chief Executive of the Law Society of Scotland, who interfered & intervened in just about any case involving crooked lawyers which had the possibility to bring changes to the way solicitors were regulated by the Law Society. Douglas Mill, staggeringly went on in the interview to blame the Royal Bank of Scotland's huge losses & failures on the financial markets on poor regulation of the Banking sector ! Douglas Mill went on in usual form : "The real failures here are failures of financial services regulation and that extends beyond the Royal Bank. The real failures here are failures of lack of governance and lack of control in the whole banking sector not just the Royal Bank again its easy to be wise after the event but scapegoating Fred isn't going to address the problems here." Indeed, it was, as you will all recall, Douglas Mill who infamously once threatened the Scottish Parliament and the previous Scottish Government with legal action if legislation was passed in the Scottish Parliament to protect consumers and strengthen regulation against Scottish solicitors. We must also not forget this is the same Douglas Mill who famously scrapped with John Swinney, the Cabinet Secretary for Finance, in front of Holyrood's Justice 2 Committee, where Mr Swinney, then in opposition, exposed the secret memos of Mill himself which eventually led to the end of Mill's career at the Law Society after the video coverage of the event was posted to You Tube. You can read more about the Holyrood confrontation between Douglas Mill & John Swinney here : Law Society boss Mill lied to Swinney, Parliament as secret memos reveal policy of intervention & obstruction on claims, complaints. In the memos, it was revealed by John Swinney that Douglas Mill had been, and was still engaged in a bitter & protracted campaign against some of Mr Swinney's constituents to prevent them from obtaining access to legal services and financial settlements in long running claims against several of Scotland leading legal firms, which Mr Mill, and the Law Society's insurers Marsh UK, intended to delay and destroy at any cost. It is worth noting that every single claim and complaint against 'crooked lawyers' which the now discredited ex-Law Society Chief Douglas Mill personally intervened in, ultimately failed to be resolved, and the particular case which Mr Swinney raised before the Justice 2 Committee along with Mill's own memos, also remains unresolved and without settlement. You may all be wondering why someone such as Douglas Mill may blame a lack of regulation of the banking sector as the cause of its catastrophic failure ? Well, wonder no longer, as the banking sector, such as it used to be, went hand in hand with the legal sector, gaining billions of pounds of business & finance in Scotland from solicitors who themselves used clients funds and a myriad of other less than open financial deals with the banks, using clients money to gain personal finance deals and deals for their legal firms on spectacularly low interest rates which ordinary consumers had to prop up through exhorbitant costs of poor legal services and thousands of cases of lost clients funds each year which the Law Society under Douglas Mill did nothing about. Interestingly, the same failures of regulation which Douglas Mill claims let down his friend, Sir Fred Goodwin, were the same kinds of regulation Mill actually fought against being implemented on the Law Society of Scotland, such as in the case where Douglas Mill claimed in an interview with Business Journalist Ian Fraser, that the Financial Services Authority would not allow any independent oversight of such things as the infamously corrupt Indemnity Insurance arrangements for Scottish solicitors known as the "Master Policy" which has led to some of the worst cases of corruption involving insurance in Scotland for decades. 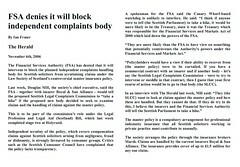 It turned out the FSA were quite happy there would be independent regulation of the Master Policy, and I wrote some more about that issue here : Chief Executive of the Law Society of Scotland branded a liar after FSA denies claims of intervention to block complaints body. You can read more about the Master Policy and how Douglas Mill as Chief Executive of the Law Society and his staff at ‘Client Relations’ implemented his 'policy for protection' of solicitors against claims & complaints here : The Corrupt Link Revealed - How the Law Society of Scotland manages client complaints & settlements. Perhaps what we learn from this story is that the banking world and legal world do tend to go hand in hand, when it comes to business, and scandals …. so both worlds need a fairly strong dose of independent regulation with effective policing of their activities, rather than the hands off approach which Mill and his kind have preferred over the years. 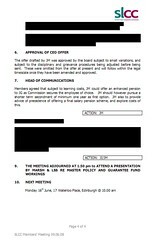 In a picture of what is fast becoming a gauge of accountability for Scottish legal issues under the current SNP controlled Scottish Government, Justice Secretary Kenny MacAskill's unaccountable Scottish Legal Complaints Commission has decided it is better to operate under complete secrecy rather than be the transparent independent organisation it claims to be. 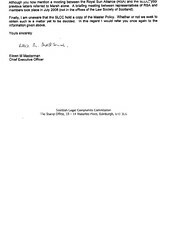 Material taken from an FOI release from MacAskill's legal complaints quango, the SLCC, which is populated by ex Police Chiefs, lawyers, members of the Law Society of Scotland, & ex public service ministerial appointees, show the SLCC to be just as secretive as the Law Society of Scotland are when it comes to operational matters, even after receiving multi million pound gifts of taxpayers money from the Justice Secretary. Financial accountability at the Legal Complaints Commission – Keep everything secret, just like the Law Society of Scotland. Worse is to come in that while MacAskill's ministerial creation, the SLCC, will release information to the legal profession itself, and selected individuals, it now appears the SLCC have been found out to be apparently operating secret rules of information discrimination which are applied to those deemed too dangerous to the issue of handling legal regulation & complaints against Scottish solicitors, ensuring certain individuals do not receive compromising material. One of those individuals on the SLCC's exclusion list, appears to be me, where as you can see from the following FOI release, papers which were released to others, were completely censored in response to my own FOI request, which has now been passed to the FOI Commissioner, Kevin Dunion for investigation. So as you can see its full steam backwards for MacAskill’s Scottish Legal Complaints Commission, as censorship seems to be the preferred order of the day, supported by elements of the Scottish Government’s Justice Department who themselves see the information I requested, as far too damaging to release to the public. A source at the Justice Department earlier this week condemned the SLCC’s attempts to maintain public secrecy over it’s less than perfect operations : “I don’t think anyone out there would believe the SLCC is an honest organisation when it stoops to this kind of level – especially when they have had so much of the taxpayer’s money to begin with”. It seems therefore, the SLCC has been forced to resort to secrecy, due to the many ongoing scandals surrounding the beleaguered lawyers complaints quango, scandals which have seen the likes of stories reporting that the quango’s members have concentrated more on pensions benefits & insurance protection than actual case handling. A legal insider reported to me that my recent reports on the faulty operation of the SLCC, “it was felt internally PC had caused considerable damage to the organisation's public credibility to the point where attempts must be made to prevent this kind of news from reaching the public in the future”. Fine then, and as that appears to amount to an attempt of censorship, I decided to test it out and ask some difficult questions of the Scottish Government today on another article I am writing about, concerning Mr MacAskill’s recent announced ‘consultation” on legal services in Scotland. Justice Minister concerned over quango revelations ? : I was given what appears to be a hostile rebuke by the Scottish Government’s Press Officials today, who now refuse to talk to me over apparent concerns I am revealing highly sensitive issues which appear to show a concerted attempt by the present Scottish Government to undermine independent regulation of the Scottish legal services market. Also up for criticism seems to be my damaging portrayal of last week’s announcement by Mr MacAskill of the Legal Profession Bill consultation, which, rather than actually widening ordinary Scots access to justice, will leave the legal services market as restricted and monopolised by the Law Society of Scotland as before, rather than allowing Scots to chose their own legal representatives. I shared the Scottish Government’s Press comments to me today with a friend who is an Editor of one of Scotland’s national newspapers, his comments were : “Well Peter what do you expect ? You are doing a lot of good reporting on complicated legal issues and they will have to try and shut you up. At least you can’t be bought off with threats of ‘pulling the ads’ or a threatening telephone call from the Law Society !”. Thanks for the vote of confidence .. I hope some of the media will take up the issues and continue to expose the lack of justice when it comes to dealing with those who supposedly represent justice ! Scottish Justice Secretary Kenny MacAskill today announced the long awaited 'consultation paper' on the Legal Profession Bill, which the Scottish Government claims will open up the Scottish legal services market to competition, a position which came about only after the Office of Fair Trading in 2007 ordered the current lawyer controlled monopoly on legal services to be ended. The year long wait by Kenny MacAskill to do anything other than announce a rather long winded consultation document, which has been authored mostly by a consultation group comprising members of the Law Society of Scotland (who wish to retain market monopoly on legal services) questions any sentiments the move on the Scottish Government's part to widen access to justice is a genuine one. Mr MacAskill it seems, prefers instead to stumble along at the slowest pace possible, at the behest of the likes of the Law Society of Scotland & Faculty of Advocates, to maintain the closed shop of legal services for as long as possible, where even after today’s consultation will end in April of 2009, it will take until at least mid 2010 to get the legislation into Parliament, in turn probably seeing no implementation until 2011 ! Staggeringly, while Mr MacAskill was making the grandiose announcement today on his legal services consultation, there were revelations the Justice Secretary had made earlier attempts last week at the Scottish Parliament to kill off Petition 1197, brought about by Bill Alexander, the Chairman of the Association of Commercial Attorneys, who via his petition, is seeking to open the legal services market up, and allow Parliament a much speedier look this year at the advantages of an open legal services market model (where a host of qualified professionals could offer cheaper, more competitive and speedier legal services), as opposed to the Law Society of Scotland's preferred 'closed shop monopoly' model, where simply you have to use a Law Society controlled solicitor if you want access to justice, and of course be at the mercy of the Law Society's infamous lack of standards, regulation and control over its widely poor quality solicitor membership. '”The Scottish Government believes that this legislation [the existing Sections 25-29 of the Law Reform (Misc Provisions) (Scotland) Act 1990 ]is appropriate to Scotland. It allows members of bodies who are not solicitors to apply for extensive rights to conduct litigation and of audience. It ensures that appropriate standards of conduct and practice are maintained in the Scottish courts. It also safeguards the consumer in that the Lord President, in consultation with Scottish Ministers, will decide what in courts and in what cases it is appropriate for members of the applicant body to exercise those rights. In so doing, the Lord President and Scottish Ministers are mindful of the training and experience required of its members by the applicant body. Consequently, there are no plans at present to amend the system of authorisation for rights of audience"
"The Lord President and Scottish Ministers have approved the scheme submitted by the Association of Commercial Attorneys for rights to conduct litigation and rights of audience subject to conditions. The Association has accepted those conditions." Anything for a little delay then, to protect the Law Society’s control over Scotland’s legal services market and the Scots public’s access to justice for a few years, forcing the public into using Scotland’s notoriously high cost, poor quality, and poorly regulated Law Society solicitor membership, who invariably end up ripping off clients on an unimaginable scale. I will write more about Petition 1197 in a later article, but for now, here is Mr MacAskill’s announcement of the legal services consultation, along with details on how to participate, which I hope as many of you who can, will do so ! Closing date for sending in the completed consultation to the Scottish Government is Friday 3 April 2009. Proposals for alternative business structures (ABS) for the legal profession in Scotland were today published for consultation by Justice Secretary Kenny MacAskill. * Reform of the regulatory framework for legal services, and removal of the restrictions on the types of business models under which a solicitor can offer such services, while allowing the traditional business model to remain an option for those who choose to carry on practising within that structure. * Regulation of ABS to apply to any other form of business where a legal professional is involved in the provision of legal services to third parties. * ABS to be regulated by an approved regulator, authorised to regulate that form of business by Scottish Ministers, with the agreement of the Lord President. * Professionals within that ABS to continue to be regulated by their own professional bodies. * ABS and professionals working in them to continue to be subject to any subject-specific regulation (such as financial services and immigration advice). * The Governance of the Law Society to be reviewed and the regulatory arrangements for the Faculty of Advocates to be made clear. "This is a once-in-a-generation opportunity to create a more flexible and modern regulatory framework for Scotland's legal services. A flourishing legal profession is a crucial part of the supportive environment for our businesses. "The proposals put forward by the Law Society and Faculty of Advocates earlier this year made clear that the regulatory framework must be proportionate to the size and scope of the legal services market in Scotland. We want to avoid having too many bodies and unnecessary tiers of regulation. Instead we should concentrate on developing a robust system of regulation to protect the profession's core values and enshrine the profession's commitments to service, probity and excellence. "We also want to avoid any confusion or disadvantage to consumers where there are new structures which may bring together different professions. "I believe the proposals published today for consultation will help the profession to remain successful and innovative in the face of increased competition and in the difficult economic climate that we are all currently going through. "I would encourage anyone with an interest in this important issue to have their say on the future of Scotland's legal services." Which? submitted a super-complaint to the Office of Fair Trading (OFT) asserting that the current regulation of Scottish legal forms restricts choice to consumers and prevents the formation of alternative business structures (ABS). In its response the OFT did not assume that the changes being proposed in England and Wales at that time, and subsequently enshrined in the Legal Services Act 2007, would be automatically suitable for the Scottish market but it recommended that by the end of 2007 the Government should publish a statement detailing its policy views in response. On November 1, 2007, the Law Society of Scotland published a consultation paper entitled 'The Public Interest: Delivering Scottish Legal Services - A Consultation on Alternative Business Structures". Later that month Justice Secretary Kenny MacAskill outlined the Government's approach to Parliament which was unanimously endorsed. He asked Scotland's legal profession to meet the challenge of change in the light of a changing marketplace, both nationally and globally, and invited them to come forward with a Scottish solution. The Scottish Government published its response to the OFT in December 2007 which detailed its policy views on lifting restrictions on ABS, where considered appropriate, for the Scottish legal services market. The Society published detailed proposals and the Faculty of Advocates published their response in spring 2008. Kenny MacAskill welcomed these responses in Parliament on June 11, 2008. To help inform the Government's proposals Kenny MacAskill set up a consultative group to explore these issues. Some of the country's leading legal and consumer experts were represented on it. The Scottish Government today brings forward proposals for the Legal Profession Bill which the First Minister announced as part of the legislative programme on September 3, 2008. The proposals in this paper for a robust regulatory regime will allow alternative business structures to operate in an open, transparent and accessible way in Scotland's legal services market.